One may wonder why the number of cryptozoological societies or clubs is so limited in Europe and particularly in France. One reason might be found in our history looking back at the Era of Enlightment, namely the 18th century. The scientists of the 18th century were to lay the foundations of modern science based upon the approach defined by René Descartes ( 1596-1650 ), soldier, mathematician and philosopher. Descartes’ ambition was to explain everything that occurred within the bosom of Nature. To that end, he decided to wipe the slate clean i.e. to get rid of the theories inherited from the past. His philosophy, for most people, is summed up in the latin formula that he coined himself : "cogito ergo sum" meaning : "I think therefore I exist". The frame of thought provided by Descartes amounted to a major breakthrough and a source of inspiration for the scientists of the 18th century and their followers even up to our times. However the cartesian spirit or cartesian turn of mind has its bad side : an excess of rationalism leads to the belief that all natural phenomena can be explained by mechanical explanations. For instance, Descartes himself described animals as if they were machines and denied them even the slightest shade of consciousness. The excess of rational thinking, still to be strongly felt today, fully deserves to be termed "the dictatorship of Reason". "C’est du Nord aujourd’hui que nous vient la lumière". [ It is now from the North that light comes to us ]. [ Light comes from the East ]. Voltaire thus underlined that the ancient theories derived from the antique Eastern Civilizations were obsolete. A new light was shining on Europe where science was becoming synonymous with progress, in every respect. During that period, a Swedish naturalist, Carl Von Linnaeus ( 1707-1778 ) produced his great classification of the plants before turning to the animals. Shadowed by the mysterious and rumoured nocturnus". In that Age of Reason, the existence of this elusive nocturnal giant seemed so plausible that Linnaeus included it in his famous taxonomy. The Wildman in the Middle Ages. It was difficult to erase the Wildman from the memories of the people. As a matter of fact the Wildman had been a popular figure as depicted in numerous texts and artworks during the Middle Ages. The Wildmen inhabited the woods, hunting, fishing, tending fields and raising poultry or even cattle, living in communities, seldom isolated. However, their relationship with humans were somewhat ambiguous. They came near the villages, kidnapping women. A passing knight, hearing the cries of the woman, would intervene, killing the creature as he would slaughter a boar. The Wildmen were covered with hair, except their hands, feet, face and breasts in the case of a female. Their favourite weapon was a club or even a whole tree. Quite often, one has underlined the link between the excess of hair and the oversexed behaviour of the creature. In certain cases, the Wildman appears as voracious, cannibalistic. It also reigns upon the animals of the forest. Its ancestry goes back to the satyrs, the Cyclops, the Ogres. The Wildman often covers his body with a bearskin but he is unkempt, rude in his manners and, so it seems, has not received the gift of speech. A poor woman took her twin boys with her while gathering wood in the forest. One of the two boys was kidnapped by a bear and learned to walk on four legs. His twin brother, now aged 20, decided to look for him. He falls upon a bear-like creature and they fight during a couple of hours. Exhausted, they rest side by side and the bear-like creature decides to follow the young man. « There is no need to fight. If you manage to pull this iron bar which I shall stick into the ground, you will be the winner ». « I had always known you were my brother ; otherwise you would never have found me ». Quite often, the medieval tales convey some sort of moral teaching. Still, when one tries to decipher these stories with a cryptozoological eye, leaving aside the whimsical traits or the moral lessons, one will discover the very nature of the Beast. The absence of speech is another characteristic of those primitive beings. However at the end of the story, he is said to be laughing which is a typical human trait. While studying other tales, one will learn that this species of wild men is apt at producing melodious sounds closely resembling human vocalizations". The Bear and Wildman are closely connected as is reflected in many carnivals which perpetuate ancient traditions in Europe, be it in France, Germany, Belgium, Swiss, Spain, Yugoslavia. A few years ago, a friend of mine was lucky and brave enough to attend the Carnival of Mardi Gras ( Fat Tuesday ) in the small village of Cournonterral in Southern France, well-known for its vineyards. During the celebration, the police would prevent strangers from attending. Some of the participants - mostly young men - play the roles of the wild men, wearing potato bags padded with straw. Others, including a few fearless young ladies, are dressed in white. The young wild men, their faces covered with badger fur masks chase the "white costumes", pin them on the ground and tar them with a mixture of stale wine and dregs collected at the bottom of the wine casks. The hunt takes a somewhat dangerous turn as the streets soon disappear under a layer of stinking reddish mud, quite slippery, while more and more wine is being consumed. One could also give many examples of festivals during which the Bear or Wildman embodies the notion of a transformation as Spring is approaching. At Candlemas, i.e. the second of February, in Prats-de-Mollo, a village in the French Pyrenees, the inhabitants enact the "Jeu de l’Ours" or Bear Game. A villager whose face and forearms are covered with a mixture of soot and oil, wearing sheepskins, walks down the hill and terrorizes the population with its groans and roars. Some villagers wearing white robes or aprons, armed with sticks, manage to catch him. In the end, a couple of barbers shave him using an axe. Thus ends the Bear Game, so to speak for it is time for the villagers to celebrate the transformation of the Bear into a civilized individual. In the Eastern French province of Savoie - a mountainous area - a saying states that if on February 2 ( Candlemas ), the sun shows in its whole, the Bear stunned by the light, will return to its den and sleep forty more days. In this case, the wise farmer had better spare his hay so that it may last till the end of winter. In Italy, one used to say that on March 25 ( Feast of the Annunciation ), Bear goes bathing ; he does not suffer from the cold and he purifies the water. Similarly, in Urnach, Switzerland, at the same period, Wildmen i.e. men covered with moss, bark and twigs of pine-trees announce the coming of spring. Thus one might infer that the Bear or Wildman helped modern man define his own seasonal calendar or to put it briefly : Bear or Wildman was the first teacher of early modern man. This reminds me of the role played by Bear as a master-healer. My Friend Ralph Bennett, a Haida carver, told me that the first shaman learned healing while following bear. Bear using his strong claws would collect bark from various trees and use it as a medicine. The shaman imitated Bear and became an expert at healing his own people. However, from the few examples mentioned above, one may affirm that at the level of folklore and / or mythology, the Wildman or Bear has left his imprint as mirrored by celebrations still alive today. Those celebrations are pretexts for having fun, for teaching some sort of morality, for conveying initiatory values. They still reflect the positive role played by the Wildman as a teacher, a grand master of the natural world, in a distant past. But one must now consider the ever-increasing influence of the religious institutions which tried to eradicate all pagan practices, from the Middle Ages up to the 18th century. Folktales or reports from the descendants of witnesses who lived at the end of the 19th century show that the crusades of the religious authorities, combined with the instinctive fear of isolated peasants, concurred to turn the Wildman into an ugly Beast or Monster. As a result, the Beast or Monster had to be destroyed. It was usually burnt as one would a witch or a sorcerer, or slaughtered as one would a wild boar. All pre-christian teachings and symbols had to be banned. No one least Branch there left behind". The Dance of the Savages. In one of his books, cryptozoologist Christian Le Noël recalls a dramatic episode of our history. It took place in 1394 at the Court of King Charles VI of France during a fancy dress ball. In those days, one may suppose that Wildmen commonly called "hairy ones" - later replaced by bears - were exhibited at local fairs. King Charles VI and his courtiers donned suits on which oakum ( cotton waste ) had been glued using pitch, in order to look like wildmen. Accidentally, their disguise caught fire. The King survived as a lady managed to wrap her long dress around him. The "Dance of the Savages" became known in our history manuals as the Dance of the Fiery Ones.
" The Wildman is a fanciful and animal-like being, covered with hides and leaves, who stays away from men in the depth of the woods. Our mountains abound in testimonies concerning this repulsive creature who is nevertheless the keeper of some precious technological know-how. According to a legend, a wildman, who had been offered hospitality during a storm on the Alps, taught the shepherds how to turn milk into butter and cheese". It would seem that the Ancient Greeks and Romans knew this archaic race and used them as field hands, thus taking advantage of their strength. But in the Middle Ages, the Church banned any comparison between Man and the Wildman. The latter could not possibly have been created in the image of God. It was to be considered as an aberration, a creation of the devil. It would have been considered as a heresy for the medieval scholars to dare study those creatures. Then one will understand why the Wildman and the Bear are often confused. Even if the Wildman is a monster, one had rather declare that one slaughtered a Bear instead of a Wildman. According to reports and testimonies, the Wildmen survived until a fairly recent date. In a letter of September 1646, a nobleman of Grenoble, Sir Salvaing de Boissieu describes the encounter of a couple of wildmen - male and female - by two loggers, at a distance of 250 meters. One of the loggers ran and came close to the female. He grabbed her hair which fell down to her elbows. The female uttered a cry and the logger, frightened, let loose. The couple of wildmen climbed up the rocks in a hurry. Their bodies were covered with hair about 8 cm long except the face and the palms of the hands. They could only vocalize. The detailed report of this nobleman makes an impression on the reader : there might have existed Wildmen in France at a time when King Louis XIV had the Palace of Versailles built. And they probably survived until later. "There is a place on the banks of the Breda Creek where we used to collect fodder with a large rock overlooking. The Sarradins lived under it [ the word Saracens meaning North African has been deformed into "Sarradins" ]. My mother had seen them. They were wildmen who could not talk. They used to come to the village and they stood at the doors of the inhabitants until they were given something. One gave them half a loaf of bread in order to get rid of them". Another story collected by French folklorist Charles Joisten is about two "wolves of some sort" that walked upright in the manner of human beings. They were accused of eating people and were called "louberous" in the local patois, meaning werewolves. The people said that if they managed to kill them, they would build a church on the very spot, which they did after a successful hunt. Two carved stones depicting the faces of the victims adorn the steeple. Christian Le Noël visited this village ( Saint-Maurice en Valgaudemar ) in the Alps and verified that these sculpted heads did exist. The church was erected in the XII century and reconstructed under Louis XIV ( 17th century ). French/German zoologist François de Sarre, an ichthyologist by training, also discovered figurations of wildmen in Homburg, a small German town near the French border. The terracota tiles of wildmen exhibited in Homburg’s castle date back to the mid-sixteenth century and represent two different types of wildmen : some "were very hairy Homo sapiens, another looked like Heuvelmans’ Homo pongoïd, with upturned nose and abundant head hair... There existed at the same time feral Homo sapiens, living like in Paleolithic times, and pongoid creatures, maybe related with some fossil-known Homo species". Let us remember that the term Homo pongoid was coined by Bernard Heuvelmans in his book L’Homme de Néanderthal est toujours vivant [ Neanderthal Man is still alive ] published in 1974. According to Bernard, it did not mean that this creature was an intermediate stage between ape and man ; he really was a man ( Homo ) with the look of an anthropomorphic ape ( Pongo ). Only the face and the stature - with a short neck - might look simian. Thus, adds François de Sarre, "the specific name Homo pongoid seems to be perfectly adequate". In his opinion, there lived, on the outskirts of organized societies various populations of wildmen. Then, one could produce many examples of tales, records, miniatures found in manuscripts, stone sculptures, wood carvings reflecting the presence of wildmen in Europe until recent times. Did the wildmen inter-breed with Homo sapiens sapiens ? Were they exploited by the latter as slave labor ? Did they degenerate because of inbreeding ? Were they burnt as "heretics" or hunted and slaughtered as "cannibals" ? Those are some of the questions some French researchers, like Jean Roche, François de Sarre or Christian Le Noël are trying to answer. As I said before, the French with their rational minds, tend to reject unknown phenomena. As a result, there is a lack of sightings concerning cryptids in general. One must also consider that Europe is densely populated and the wilderness tends to disappear. At least, our British neighbors have filed 438 reports about Big Cats, lynxes and pumas in 2001, "an exceptional year" according to the British Big Cat Society. Last year, a wildman was supposedly filmed in a wood in the small country of Luxembourg, located between France, Belgium and Germany. The pictures I was sent via Internet were unconvincing. A few years ago, in 1997, the Italian press mentioned the presence of a giant creature, about 2 meters high, with the body of a gorilla and a human head. It was seen by a policeman patrolling the border at night on July 27, 1997. The witness declared : "His features were those of a withered old man, with a short neck, long hair, dark complexion". After an article on the subject was published in the weekly "La Riviera", the magazine was contacted by a 27 years old-student who stated that he had seen a similar creature on May 7, 1997, in the same area, near Vintimiglia, an Italian city close to the French border. The creature is supposed to live in one of the numerous caves of Balzi Rossi, in the hills overlooking the town, near the ruins of an old manor. According to an article published in the daily "Il Giornale" of October 24, 1997, the difference between the yeti and the Italian giant is that the latter is the result of artificial crossbreeding while the yeti evolved slowly following a natural process. The article reminds one that before it was bombed in 1944, the manor was inhabited by a famous Russian surgeon and biologist, Sergei Voronoff who tried to extend human longevity and sexual potency while transplanting gorilla testicles onto human males. This sounds like Frankenstein’s experiments. Still controversies have not died out after Voronoff passed away in 1951. "It is possible to create a hybrid by crossing a human and an animal". Then the mysterious Italian giant could be the offspring of one of Voronoff’s hybrids. The journalist suggests that the existence of the yeti might prove that the artificial creation of a humanoid is possible and vice-versa. Without any further information, I’d rather leave the Italian giant where it belongs i.e. the realm of fantasy. However I believe it might be worth delving into Voronoff’s writings and experiments which I will do when I have the time. As a rule, recent sightings of giant cryptids are so scarce that the European stage looks desperately empty to an American eye. However, I am convinced that the more we study the folk-tales, legends, fables, testimonies of descendants of witnesses, engravings, carvings, etc..., the more one becomes aware that the wildman survived in Europe until a recent date. "Is the abundant folklore, say, about the wolf or bear not a consequence of these animals and man’s knowledge of them ? ... Therefore we say that, if relic hominoids were not reflected in folklore and mythology, then their reality can be called into question". Presently a number of cryptozoologists has undertaken research along that line, collecting texts and stories, photographing sculptures and at the same time analyzing those pieces of evidence, following the methodology devised by Dr. Bernard Heuvelmans. In my view, it has already proved fruitful and provides a valuable complement to the results achieved at a different level in North America. 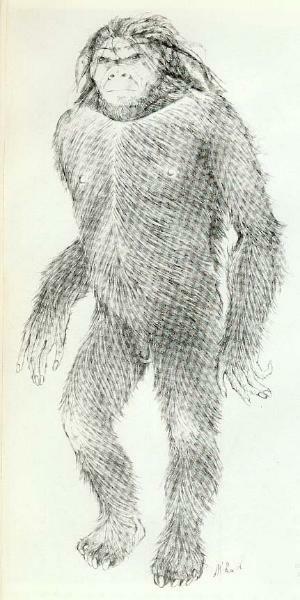 Although cryptozoology remains unknown to the majority of people1, there is a renewed interest in the evolution of Man. Since the discovery of Lucy in Ethiopia in 1974, the articles on the latest discoveries in paleontology have abounded. In our troubled era, we seem to turn towards fossil finds in order to trace our roots way back in time. One should add that fiction keeps providing food for thought. As an example, let me mention the archetypal novel You shall know them, translated from the original book written by French author Vercors in 1952 [ Les Animaux Dénaturés : The Altered Animals ]. It is about a British journalist, Douglas Templemore, who accuses himself of having murdered in cold blood his own new-born baby. The child was conceived via artificial insemination, the mother belonging to a species close to Homo erectus which appeared 1.8 million years ago. Vercors calls the members of this unknown species tropis ( a contraction of anthropos meaning man and pithecos meaning ape ). These tropis were discovered during a scientific expedition in New-Guinea. As a member of the expedition, Templemore would have had plenty of time to study the tropis, had not an Australian lumber company decided to use the tropis as slave labor. Templemore has decided to kill his son and denounce himself. He wants to be condemned for this homicide. The novel is centered on Templemore’s trial. The question is : "Are the tropis sophisticated animals or are they human beings ?". Numerous specialists - paleontologists, zoologists, lawyers, priests - are invited to testify. The novel is an amazingly clever pretext at re-examining various theories and points of view. One of the issues at stake is that of crossbreeding. If the tropis are apes, they should have 48 pairs of chromosomes while humans have only 46 pairs. The difference is slight. But one ought to remember that a trisomic child2 has only one extra chromosome compared with a normal human being. This child belongs nevertheless to the human race. In the end after many heated debates between the specialists, the argument which will convince the jury of the humanity of the tropis will come from a lay woman. She has noticed that the tropis who eat raw meat smoke some of it, not in order to keep it but as a primitive worship of fire, as a homage to its purifying power. It is the sign of a rudimentary religious mind. These altered or denatured animals have left the natural world to enter the world of humans. The author adapted his novel for the stage and I watched the play at a theater in my home town in 1993 [ Title : Zoo or the philanthropic assassin ]. There is a continuous stream of what the French call "prehistorical novels", some of them translated from the English, such as Neandertal by John Darnton ( 1996 ) ; or the novel Silex. La Tombe du Chasseur [ Flint. The Hunter’s Grave ] by Belgian writer Daniel de Bruycker ( 1999 ) also about Neandertal. "... I established numerous relationships in almost all countries, and even a number of bonds of solid friendship, and so created a quite unique sort of international network of correspondents, a sort of Interpol devoted to the detection and tracking down of hidden animals, or, put more precisely, a Bureau of missing animals" ( Bernard Heuvelmans. On the Track of Unknown Animals, Third revised English edition, Kegan Paul International, London, 1995 ). One of the basic aspects of Bernard’s method consists in relying on the native people. Thus one is led to pay great attention to the languages, customs of the countries where unknown species are likely to be found. This respect for the knowledge of the indigenous inhabitants is, according to me, likely to prove most fruitful at several levels. As naturalist Gerald Durrell put it "... Dr. Bernard Heuvelmans has marshaled an astonishing parade of unknown animals, and he has done so with great skill and scientific detachment...". This we all know and I won’t elaborate further on it. Besides in her recent autobiography Le Testament d’une Fée [ The Fairy’s Testament]3, Bernard’s ex-wife has precisely described the sympathy he felt towards living creatures. This sympathy or tendency to share another creature’s condition reached its most perfect expression in the presence of apes or monkeys. Incidentally, Bernard and his wife had shared their tiny Paris studio for ten years with a capucin monkey. Many a fascinating anecdote reflects Bernard’s deep perception of Nature. However what remains to be done is to decipher the main theoretical or conceptual aspects of Bernard’s writings. Although he was a classical darwinist by training, he hypothesized that our direct ancestor was a small sized bipedal Homo sapiens dating back to the Miocene ( 23.8-5.3 millions years ago ). It results then that the Wildmen survived along Homo sapiens without being evicted - or totally evicted - by sapiens. Homo sapiens is represented by the trunk of the tree of evolution and parallel branches represent different species - from the tree-dwelling tailless monkeys of 20 million years ago to the fairly recent Neandertal. "It is Homo sapiens who remained the most primitive and the anthropoid apes were those to evolve the most...". Thus all anthropoid apes including Bigfoot have evolved into types which resembled less and less their common ancestor or Homo sapiens while occupying specific ecological niches ( mountains, forests... ) in accordance with their needs. Bernard thought the yeti was a Gigantopithecus as he believed that the survivors of that species were restricted to South-East Asia. The Caucasian almasty was a relic Neandertal. Bigfoot was certainly a giant Homo erectus and in that respect his views differed from those of the late Grover Krantz. Bernard was impressed by the fact that the feet of Sasquatch looked almost human. Mere speculations some might say ! Of course, an excess of rational thinking may prove misleading but a complete lack of it may turn harmful. In fact, any honest hypothesis deserves our attention even if new ideas sound complicated or funny at times. Like when I heard of the new phylogeny called cladistics, a classification which is supposed to be more adapted to the theory of evolution. It does away with external appearances so that the crocodile for instance belongs to the category of the birds instead of the lizards. Which at first made me laugh. On second thought, if the new classification proves a fruitful guide, why should I reject it ? To conclude, I would like to recount an anecdote about Bernard Heuvelmans who introduced me to some of his howler monkeys in his property in Perigord, not very far from the famed caves of Lascaux. "Aren’t those monkeys supposed to live in Brazil in very warm climates ?". "True. This is what the specialists write in their books but my monkeys have never read them". Daniel de Bruycker, Silex. La Tombe du Chasseur, Actes Sud, Arles, 1999. John Darnton, Neanderthal, St Martin’s Paperbacks, N.Y., 1997. John Heath-Stubbs, Collected Poems 1943-1987, Carcanet, Manchester, 1988. Bernard Heuvelmans / Boris Porchnev, L’Homme de Néanderthal est toujours vivant, Plon, Paris, 1974. On the Track of Unknown Animals, Kegan Paul International, London and N.Y., 1995. Alice Joisten, Christian Abry, Etres Fantastiques des Alpes, Editions Entente, Paris, 1995. Christian Le Noël, La Race Oubliée, Cheminements, 2000. ( e-mail : orbleu@cheminements.com ). Alika Lindbergh, Le Testament d’une Fée, e-dite, Paris, 2002. Jean-Marc Pasquet, Le Don de Qâ, Jean-Claude Lattès, Paris, 2001. Vercors, You Shall Know Them, Little, Brown and Company, Boston, 1953 [ Translation of the French novel : Les Animaux Dénaturés, 1952 ]. Bipedia ( editor : François de Sarre ) ; address : C.E.R.B.I. Some of my colleagues even believed that « cryptozoology » was the name of a sect. The Minnesota Iceman or Homo pongoid that Bernard discovered in the US in 1968 apparently originated in Vietnam and was a surviving Neandertal.